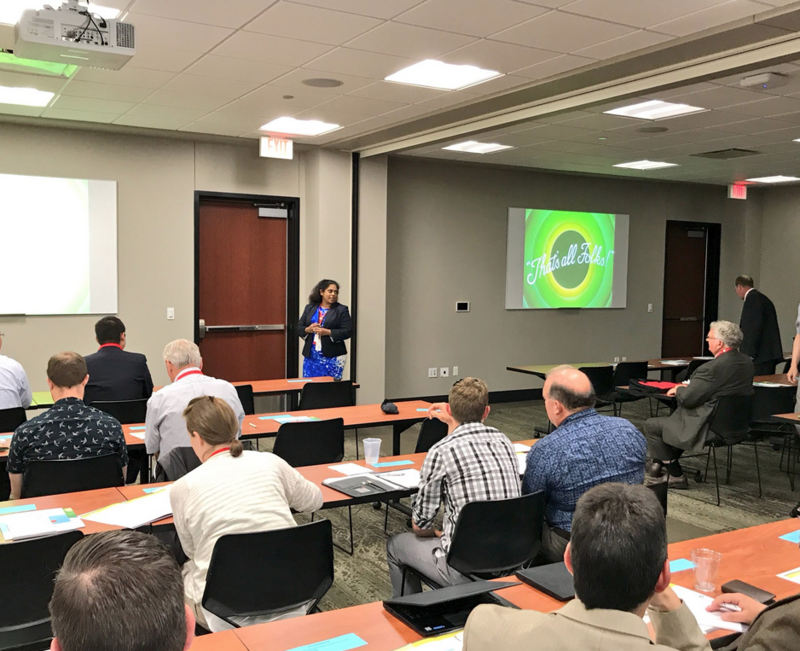 Angela Anandappa leads a session during the annual meeting of the Alliance for Advanced Sanitation May 22-24 in Lincoln. The meeting featured presentations by a number of distinguished speakers, including Karl Thorson, food safety and quality manager of global sanitation at General Mills. Thorson spoke about the danger uncontrolled water can be as a contributor to the growth and persistence of pathogens in food processing environments. Thorson stated that conversion to water-controlled methods has the potential to improve microbiological results during validation and verification of all sanitation tasks. A breakout session on specific topics of relevance to food manufacturing hygiene and a research poster session were other highlights of the meeting. The poster session highlighted a few of the research projects the alliance has led, such as a study investigating microbial communities in food and the food processing environment. The research outlined some of the tools that might be of benefit to the industry, thanks to recent advances in tools for molecular genetics. Launched by the University of Nebraska–Lincoln and founding industry partners in 2015, the alliance works to improve sanitation approaches and practices with and for the food industry. Alliance activities are focused on all manners of food safety hazards, including microbial pathogens, allergens, toxic chemicals and water conservation in sanitation operations. The meeting was held at Nebraska Innovation Campus, home of the university’s Food Processing Center. Much of the research conducted in the center is used by alliance members to improve sustainability and productivity practices. To learn more about the Alliance for Advanced Sanitation, visit sanitationalliance.org.